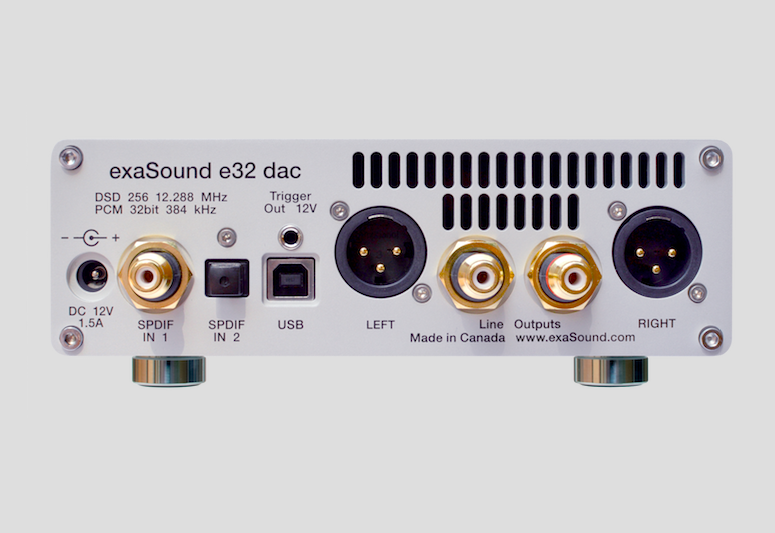 Built in Canada, exaSound’s e32 DAC and PlayPoint Network Player are housed in small extruded silver aluminum cases, each measuring 6.5” x 2.2” x 9.25” and each weighing 2.4 pounds. Both use external in-line power supplies. The PlayPoint sells for $1999, the e32 for $3499. The PlayPoint will play multichannel recordings—up to eight channels. . Since they are so small, the PlayPoint and DAC easily fit side-by-side on a standard rack shelf. Need even more room? You can stack the PlayPoint on top of the DAC; their unusual polished metal feet with O-ring cushions on the bottoms won’t scratch the surface you place them on. The PlayPoint and DAC will play PCM files up to 384kHz/32-bit, and DSD files up to DSD256. That’s just about anything commercially available, except MQA. When I asked about plans to add MQA playback to the player, exaSound president George Klissarov said he was working on it. The DAC has both balanced XLR and unbalanced RCA outputs. Since it has a volume control with a remote control (an Apple remote), it can be used as the control center for your system, and drive a power amplifier directly. It also has a surprisingly good built-in headphone amplifier, so if ’phones make up a part of your listening experience, you won’t necessarily need a separate amp to drive them. The PlayPoint and e32 DAC easily fit side-by-side on one shelf of my equipment rack, leaving enough room there to hold my 2.4” wide Rothwell Headspace moving-coil headamp. I connected the PlayPoint to my home network using a Cat 7 network cable and, via a Wireworld Platinum Starlight 7 USB cable, to the e32. I connected the e32 to the linestage using Audience Au 24 SX balanced cables. Both the PlayPoint and the e32 were plugged into an Audience aR6T power conditioner. The Roon Remote app running on my iPad Air 2 controlled the Roon Server on the PlayPoint. I tried several other remote control apps for various streamers/servers left on my iPad from previous reviews and discovered that Esoteric’s Sound Stream app worked quite well with the PlayPoint; I slightly preferred its user interface to Kazoo’s. And it sounded doggone good, too.